Feel the difference in a visit to Donegal’s unspoiled Inishowen Peninsula. Following the meandering roads to the most northerly tip of Malin Head where the next stop north is Iceland just 1,400km away! With 1,100km of spectacular Atlantic coastline around Donegal which boasts being part of the Wild Atlantic Way. Viewing points such as Sliabh Liag (Slieve League) – known as the highest sea cliff in Europe, beauty of the cliffs and ruggedness of the mountains. Travel onto the spectacular Glenveagh National Park and Castle where there are tea rooms to enjoy a cuppa or see the herd of red deer or majestic Golden Eagles. Choose from the Tropical World at Alcorns in Letterkenny – Ireland’s Butterfly house and mini zoo or Waterworld Aqua Adventure playground in Bundoran. Pick out Traditional Music Sessions or check out the homeplaces of some of our more know international musicians such as Daniel O’Donnell Visitor Centre, Enya, Clannad, Rory Gallagher or the Poet William Allingham birthplace & grave in Ballyshannon. For hill walker or photographer enthusiasts, enjoy our quartzite conical peak of Errigle, near Gweedore, Donegal’s highest mountain or enjoy the 10 mile coastal walk overlooking Donegal Bay from Ballyshannon to Rossnowlagh! Experience Irish Culture and history at the Doagh Famine Village, Donegal Craft Village, Magees of Donegal, Glencolmcille Folk Village Museum or Ballyshannon Historical Museum. Lough Derg invites you to take part in daily pilgrimages or retreats where you will also explore the culture and heritage and leave with renewed hope! Enjoy our china tours at Beleek China, Fermanagh or Celtic Weave China (near Ballyshannon) and learn about the crafts of contemporary and traditional china. Theatre and Musicial entertainment can be enjoyed at The Abbey Arts Centre, Ballyshannon, Balor Arts Theatre in Ballybofey or An Grianan Theatre in Letterkenny. Visit Flight of the Earls Heritage Centre in Rathmullan, Donegal Railway Heritage Centre or Killybegs Carpet & Fishing Centre. We have a choice of tours to offer from Donegal Bay Waterbus in Donegal Town to Boat trips from Sliabh Liag around the bay. Wild and beautiful islands such as Arranmore Island, Gola Island, Tory Island and Inishbofin Island to choose but a few to enjoy the Gaeltacht (Irish speaking) areas of Donegal along with the island terrain being rugged! 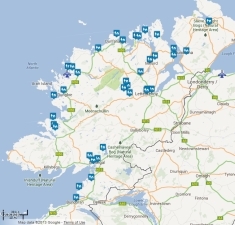 Contact Donegal Self Catering providing a guide to Self Catering Cottages, apartments and houses to rent in County Donegal Ireland.